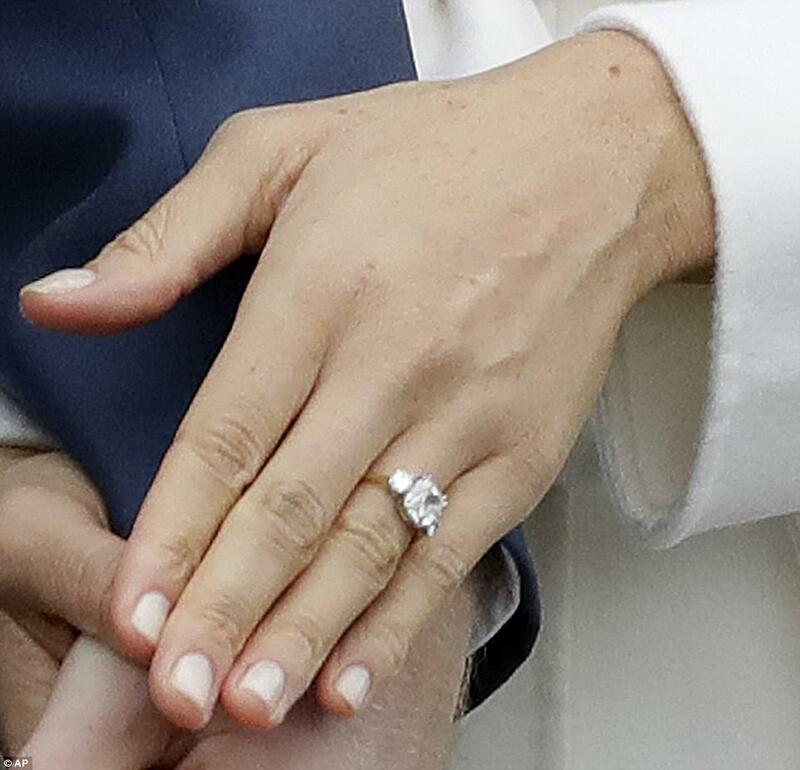 Meghan, 36, also showed the world her engagement ring designed by Harry himself containing two diamonds from Princess Diana's own personal collection set in a gold band. 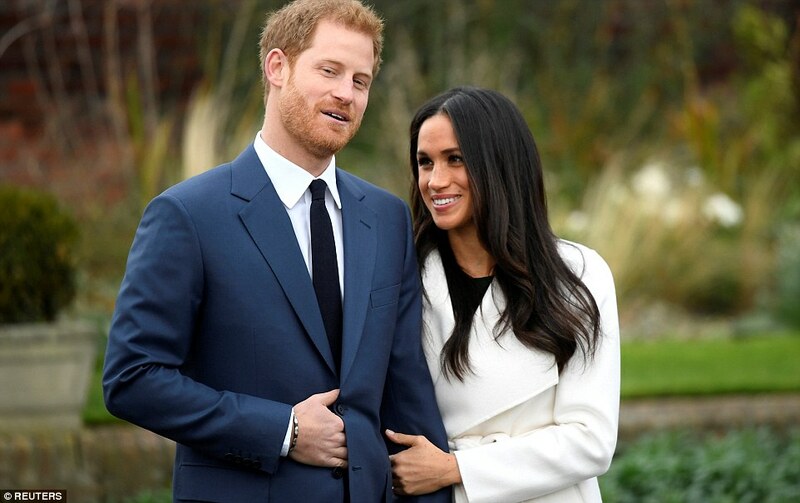 The couple will marry in church in spring 2018 after the prince proposed in early November after getting permission from the Queen and Meghan's parents. 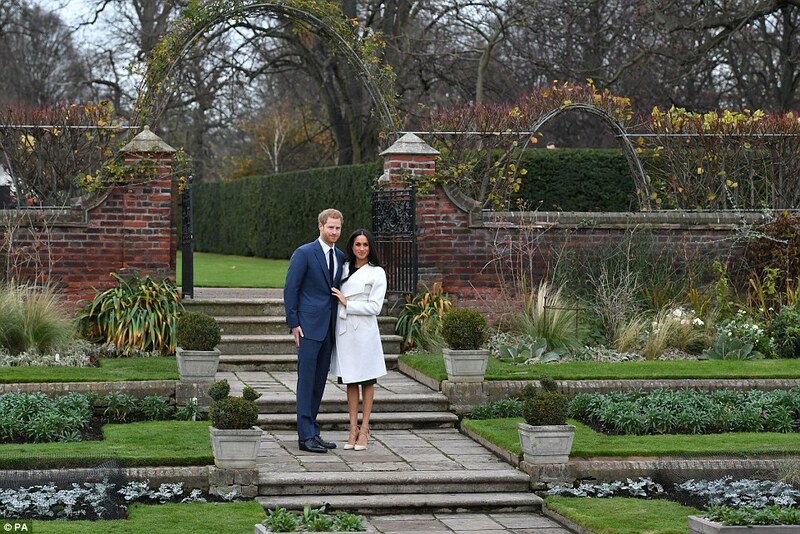 Harry looked nervous but happy as they made their first public appearance since the announcement in the Sunken Garden at Kensington Palace, much loved by his late mother Princess Diana. His fiancee stroked his arm lovingly as they spoke to reporters, who asked him: 'When did you know she was the one?' and he replied: 'From the very first time we met'. He refused to say how he proposed saying: 'That will come later' but when asked if it was romantic he said: 'Of course it was' - but the couple didn't kiss for the cameras. The prince said he was 'thrilled, over the moon' adding: 'Very glad it's not raining as well.' 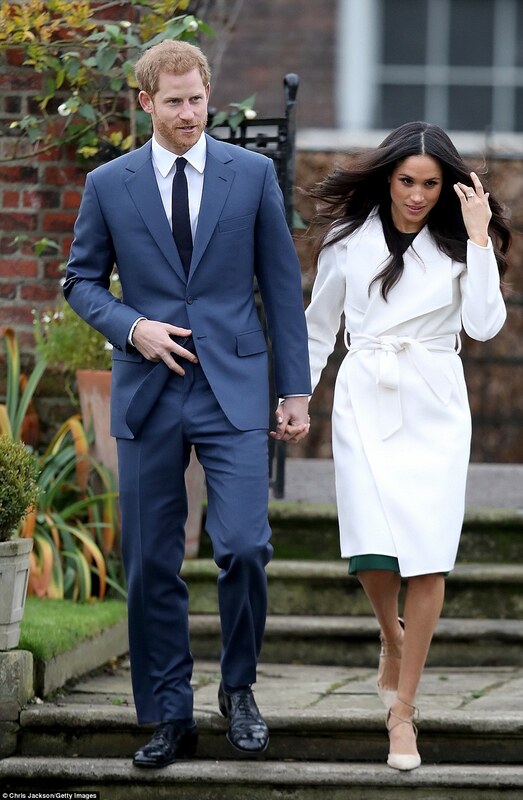 Meghan said she was 'so happy, thank you' before they wandered back into Kensington Palace beaming. The prince said he was 'thrilled, over the moon' adding: 'Very glad it's not raining as well.' 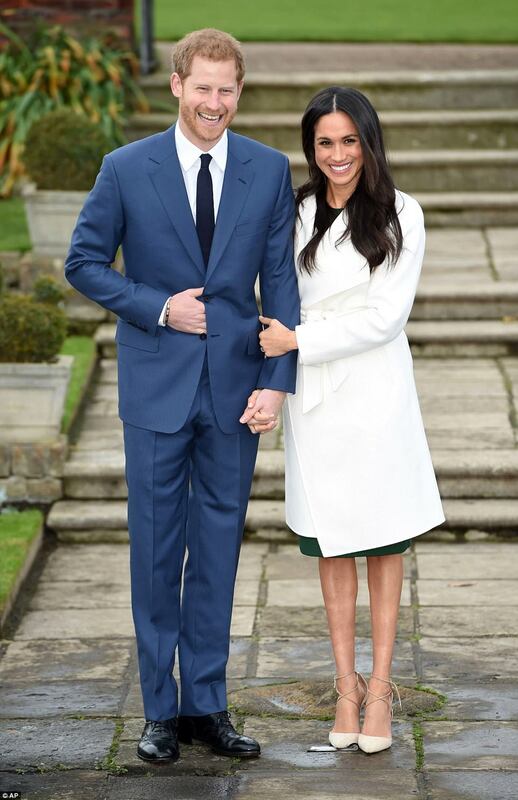 Meghan said she was 'so happy' before they wandered back into Kensington Palace beaming. 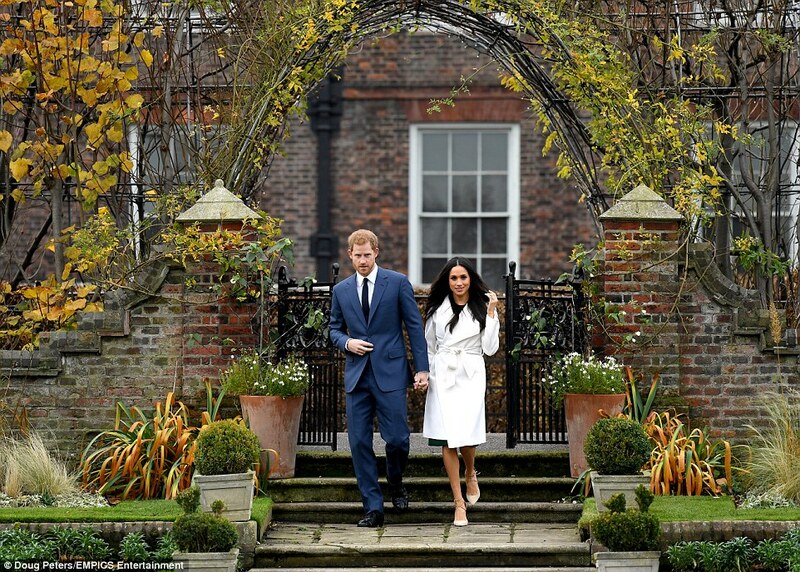 Britain's Prince Harry and Meghan Markle walk away after posing for the media in the grounds of Kensington Palace. Kensington Palace said the prince designed Ms Markle's engagement ring himself - using two stones which belong to his late mother. 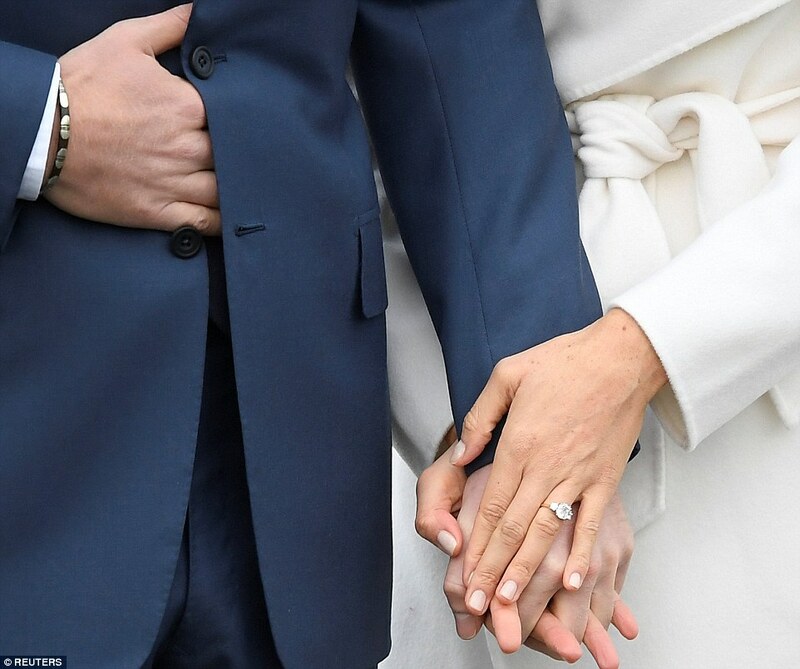 Kensington Palace said the prince designed Ms Markle's engagement ring himself - using two stones which belong to his late mother Princess Diana. 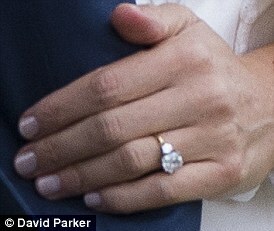 The two outside stones are diamonds from the personal collection of Princess of Wales. The band is made of gold and the ring was made by Cleave and Company, Court Jewellers and Medallists to Her Majesty The Queen. At the centre is a diamond from Botswana, a country that holds special significance for Harry who has visited many times since he was a child and they went on safari in September. In a statement Her Majesty and Prince Philip said they are 'delighted for the couple and wish them every happiness' and this morning huge crowds of tourists and royal fans gathered outside Buckingham Palace. The Duke and Duchess of Cambridge said in a joint statement: 'We are very excited for Harry and Meghan. It has been wonderful getting to know Meghan and to see how happy she and Harry are together'. The boys' father Prince Charles said he was 'thrilled' and 'very happy indeed' for them. 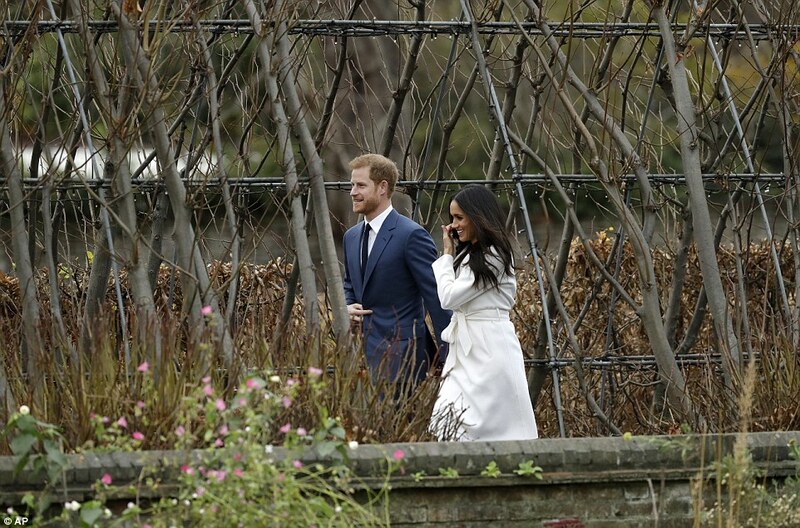 Harry also asked Meghan's parents Thomas Markle and Doria Ragland, who divorced when their daughter was six, for her hand in marriage before popping the question a few weeks ago, it emerged today. They said: 'Our daughter has always been a kind and loving person. To see her union with Harry, who shares the same qualities, is a source of great joy for us as parents'. Harry and Meghan have not said where they will marry but most senior royals marry at Westminster Abbey, St Paul's Cathedral or the chapel at Windsor Castle. Sources have said it is likely to be a church wedding, especially after the Archbishop of Canterbury gave his blessing today. Meghan could become a princess or alternatively be given the title Duchess of Sussex when she marries the fifth in line to the throne and joins the royal family. But they are likely to wait until Prince William and Kate have their third child, which is due in April. Bookmakers refused to take any more bets on the couple getting engaged last week as Meghan landed in London and started moving her belongings and two dogs to the UK. 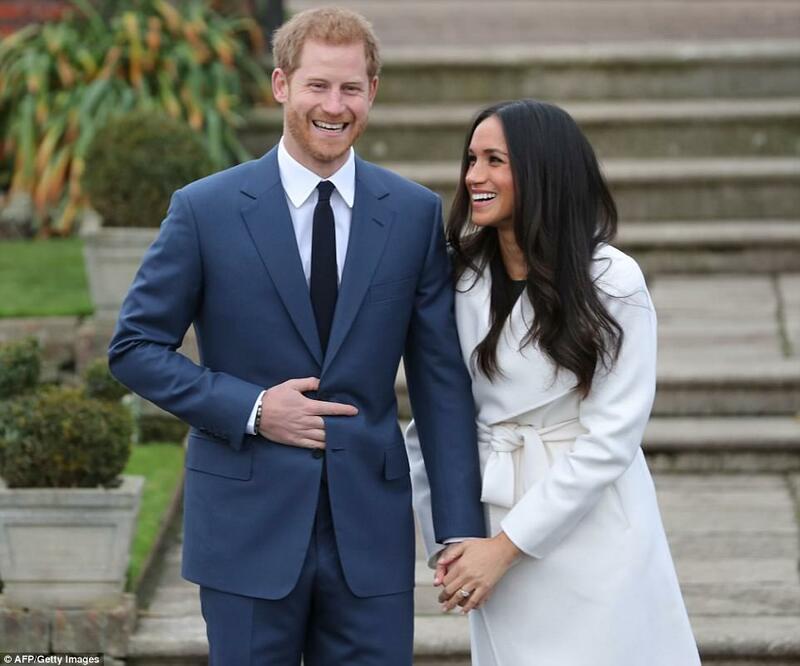 Social media went into meltdown but they have had to wait until today to hear that the fifth-in-line to the throne has proposed to his actress girlfriend. 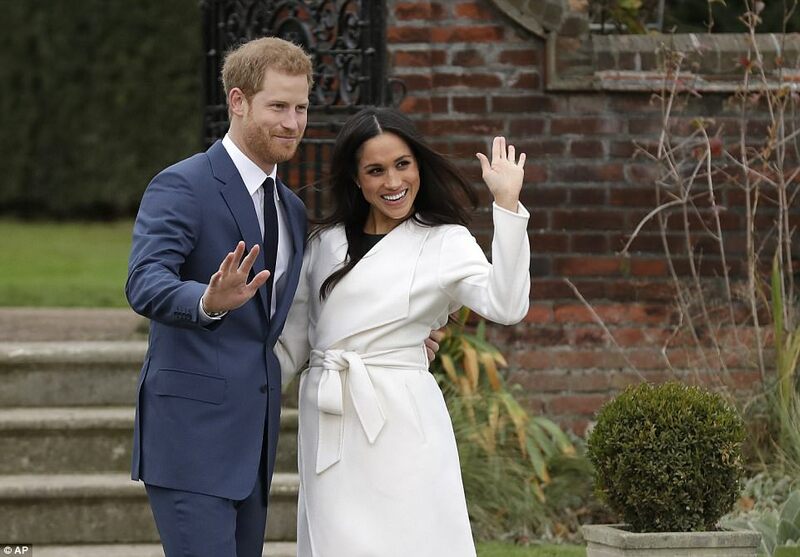 Harry and Meghan will marry next year with Windsor Castle the favourite ahead of Westminster Abbey or St Paul's.